After attending a meet up in NYC on hurdles & learnings of implementing the design thinking process, I came away with a few thoughts to chew on. Enjoy. When communicating solutions, remember your audience could want a 1-pager, a 5-slider, a full deck, or a combination. If there’s time, include prototypes, even if not functioning, and videos of audiences using them. Bar meetups are great for prototype feedback when focus groups are out of budget. When searching for insights, ask everyone along the interaction chain. Patty Beirne at Sloan Center for Cancer Research said the employees with the most intimate patient knowledge were the housekeeping staff — they were the ones patiences opened up to most in times of desperation. To empathize, consider what someone does, thinks, feels, and sees about the topic or subject being redesigned. Do this before looking at product usage feedback for answers for a more humanistic approach. MAN WHO LET NATIONWIDE INTO THE PARTY? 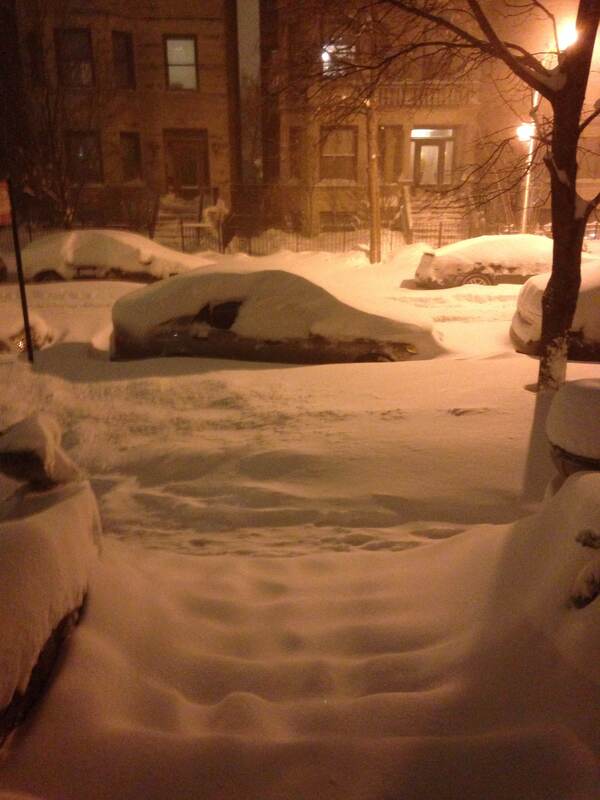 That Nationwide PSA ad was a buzzkill, as proven by the Twittersphere. Yes, Nationwide showed it cares about higher purposes and current societal issues, and they captured attention in an alarming way. But the Super Bowl audience is a group that showed up to their couch to relax, laugh, and have a good time. Their mindset is anything but serious (unless you were a Seahawks for Patriots fan). There’s really not great time to show this ad, but don’t show it on the most cynical ad night of the year! I’d worry that brand perception took a step back with the way Nationwide blew up on Twitter. Although Nationwide did try to end on Mindy’s happier note, I just don’t think it was enough. Lots of good press this week, though. Adweek echoed my initial reaction to each ad earlier this week – “man this is a beautiful spot, but it’s already been done!” The old-school speech voiceover combined with beautiful imagery raised a few goosebumps, but in the end, but it felt much too similar to RAM’s recent “Farmer” commercial. Maybe this style needed a year to breathe, but let’s add to the conversation, shall we? 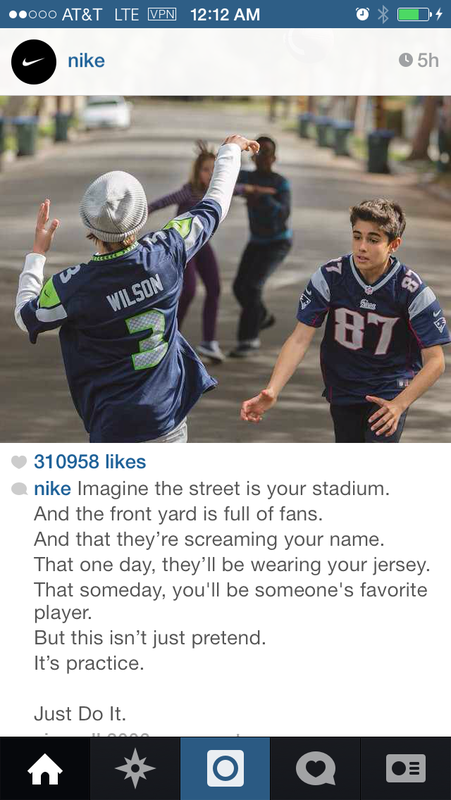 She’s proud, it’s authentic, and the #ad at the end is more like a Super Bowl tag given the night’s context. 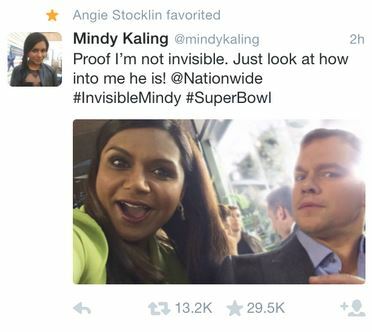 Mindy Kaling’s tweet didn’t even include the #ad tag, she just tweeted it! The single biggest annual sporting event on the planet. The pinnacle of creative television advertising. And perhaps the quickest way to blow $4.5 million dollars outside of Las Vegas. After awhile, Super Bowl ads have earned a high enough reputation to become a showcase of criticisms, like a one-night museum collection – you can put anything on a museum pedestal, call it art, and suddenly viewers start forming normally non-existent opinions. But instead of a museum, you have a Super Bowl TV schedule. So, here’s my six part micro-analysis on the good, the bad, the best, the game, and the left shark. Teressa Iezzi opens The Idea Writers with Droga5’s David Droga earning a spot on the 2006 Esquire “Best and Brightest” list. Being a man of the ad industry, Esquire asked him to create an ad about himself. Rather, he activated Tap Project, a UNICEF campaign supporting clean drinking water worldwide, within the ad. After a website, some restaurant endorsements, a fundraising event, water essays & more, $0 media dollars turned into $5.5 million. Droga ventured beyond the printed page and won. The eyesore to the American country side and cityscapes everywhere. If it wasn’t for good art directors, they may cease to exist. When they’re such an expensive, immeasurable form of advertising for most brands, and with limited verbiage (Ogilvy’s recommended words: 5), why would somebody want to use a billboard? Typically for two reasons: direct response (Cracker Barrel’s “14 meals under $7.99 – NEXT EXIT” ads) or to create brand awareness through the mere exposure effect (Ex – You pass the same ATT ad every day on the way to work). Brand awareness works because familiarity leads to purchases. 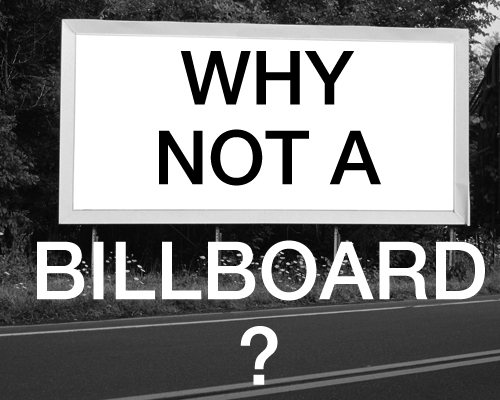 So why not a billboard? For one, billboards are expensive. Depending on the city, they cost tens of thousands of dollars a month to make and keep around. For your brand paying that much money and only getting to say “Hey, we’re here. We exist,” and nothing more, it feels there are better options that can provide more value than a quick laugh or another impression to support that mere exposure effect. Why can’t you create exposure to a brand that solves a problem? This audience participation leads you to remembering that interaction, because people learn most and retain information best by doing. This leads to taking ownership of the brand, and hopefully ends up with the person becoming the ultimate goal of advertising: a brand advocate who lives their life in accordance with the brand’s purpose and identity. In February, I helped a Wabash advertising mentor with an advertising overview for students. I spoke about online advertising, but it was my brother Nic’s take on media planning that stuck with me. In his talk on media planning, he addressed the knock that only people in the creative advertising agencies are creative, and that media buyers aren’t creative. He said with all the places you can put media today, that’s simply not true. And I totally agree. Really, the media placement sets the stage for the creative message if the media’s bought first. Which is why, after speaking with a big agency media planner, that media planners are now at the same table as the creative agencies during the planning process. There’s simply too many places you can put an ad for a copywriter and art director to make a well-informed decision for the client. Shoot, Adweek even put up a video from media leader Monica Karo talking about it this week after I wrote this post! Monica touches on the fact that media agencies are beginning to be involved earlier in the creative ideation process due to ever expanding media options. So for today’s media planners, the times are certainly more exciting. Sure, they can go with the standard billboard and get their name out there to a mass amount of people. But they’ll risk being ignored because like online display ads, billboards are in a specific, reiterated shape and location that we’ve been trained to ignore. 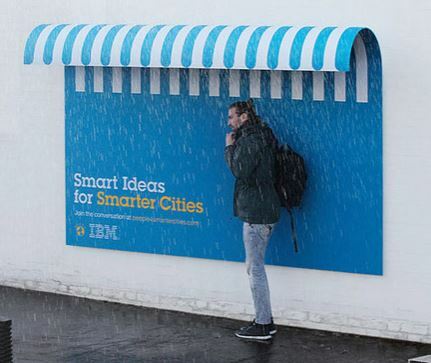 Their value is minimal, the ad is just an ad, not a solution. 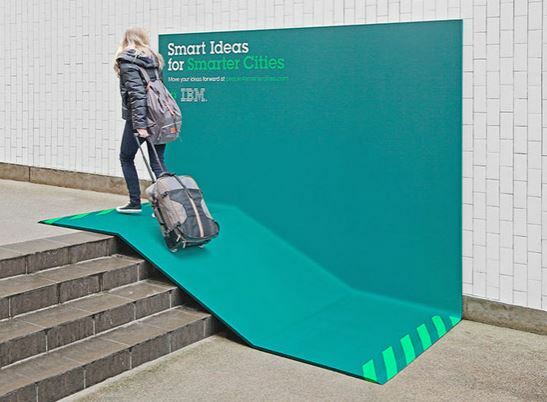 On the other hand, an environmental, experiential ad provides value by solving audience problems that create not just consumers, but brand advocates. 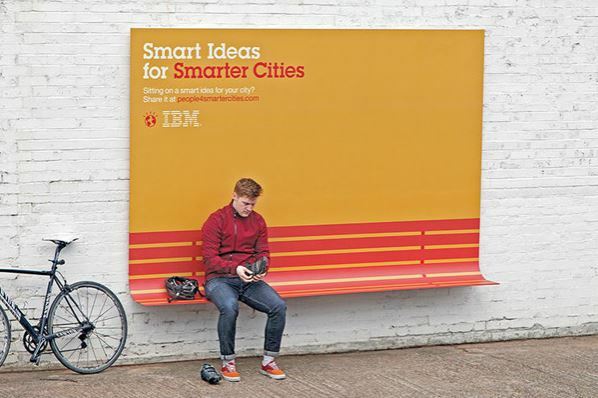 Yes, these ads, like IBM’s environmental bench ads below, create product awareness. But these ads “convey a product truth in an engaging, entertaining way,” one of Leo Burnett’s main goals in the path to HumanKind acts. If you do that, the product and brand get remembered, and the ad viewer/user is helped at that viewing-moment. Everybody wins. but there’s simply better ways to use ad dollars. HumanKind says that “If communication is trying to change human behavior, the communication itself needs to be located within that behavior.” Screw the billboard. Find a different shape.